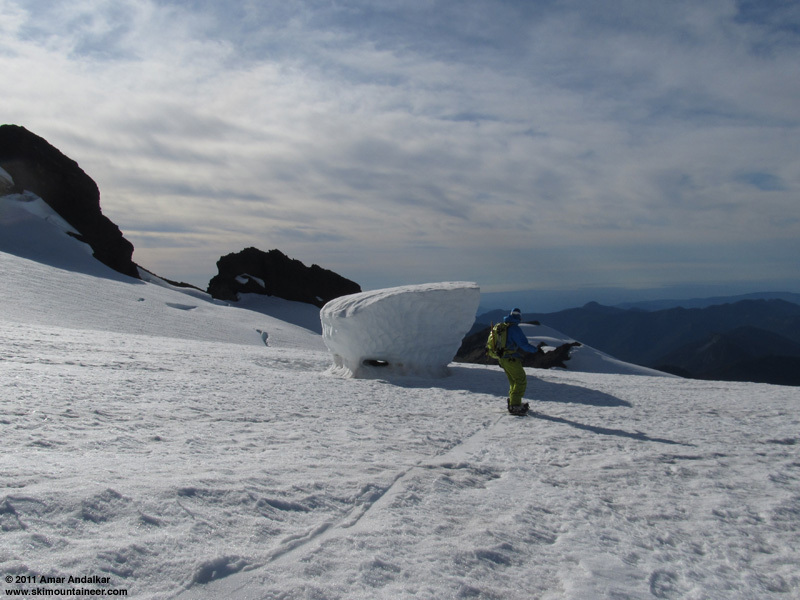 Following a late-summer storm over the weekend which brought the first new snow of the upcoming season to high elevations of the Cascades, the forecast for Tuesday looked near-perfect: sunny skies, light winds, and 13500 ft freezing level. 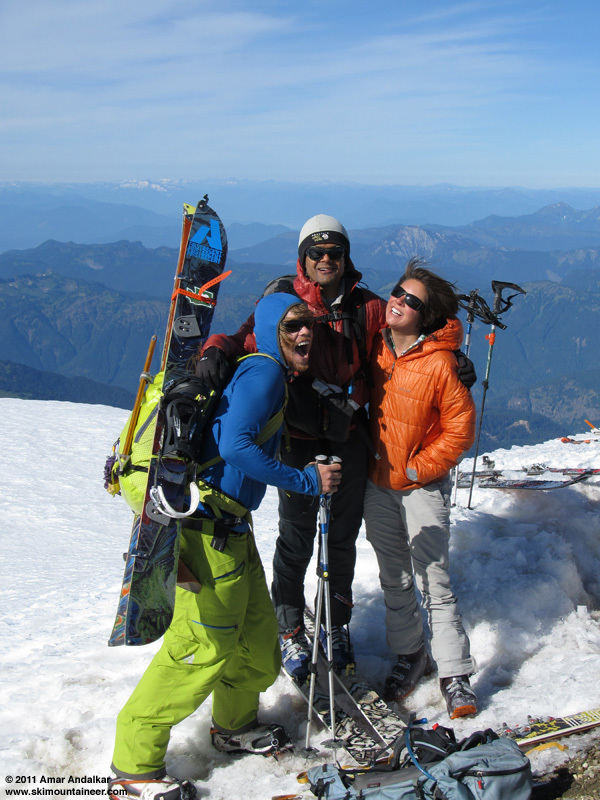 A summit ski of Mount Baker seemed like the best plan, and Kyle and Hannah were game to try it. Based on telemetry, several inches of new snow were likely to have fallen above 9000 ft, although rain had also fallen to over 10000 ft during the storm. We weren't sure whether the ski conditions would be any good, but decided to take a chance anyway. The reward: a magnificent continuous run of 5000 vertical feet from the summit, most of it on smooth corn snow. Outstanding! Carving the corn on the Roman Wall, with the Black Buttes below, and Twin Sisters Mountain and Puget Sound in the distance. 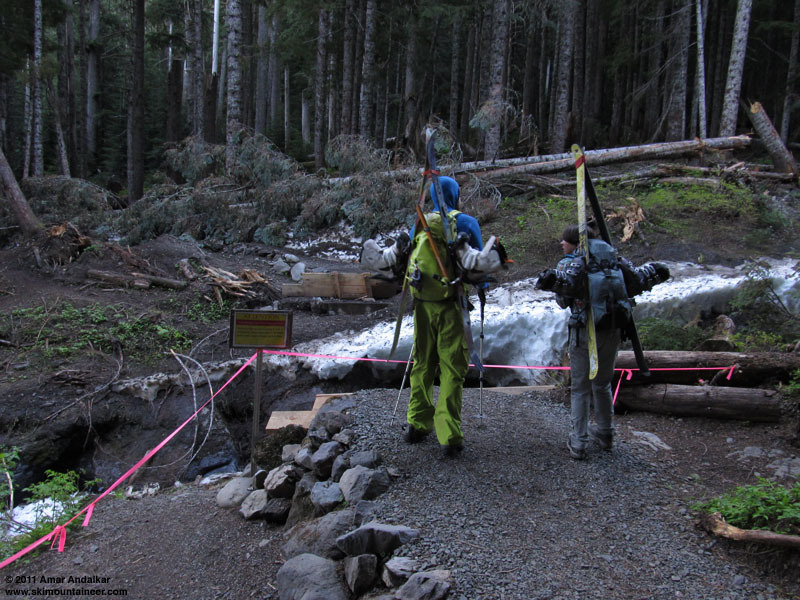 The new $30,000 steel and timber bridge completed in July 2010 was destroyed by a massive avalanche in early April 2011 (see this thread for more info). Luckily, the creek was easily crossable by descending snow and rocks about 30 ft into the gorge and crossing on a shattered log, then scrambling up an incipient climbers' trail on the far bank. Then a pleasant hike up the trail to Hogsback Camp, the late-summer warmth thankfully preventing any ice from forming overnight. We were treated to a colorful explosion of wildflowers along the Hogsback above 5000 ft. About 100 minutes of hiking to reach snow. 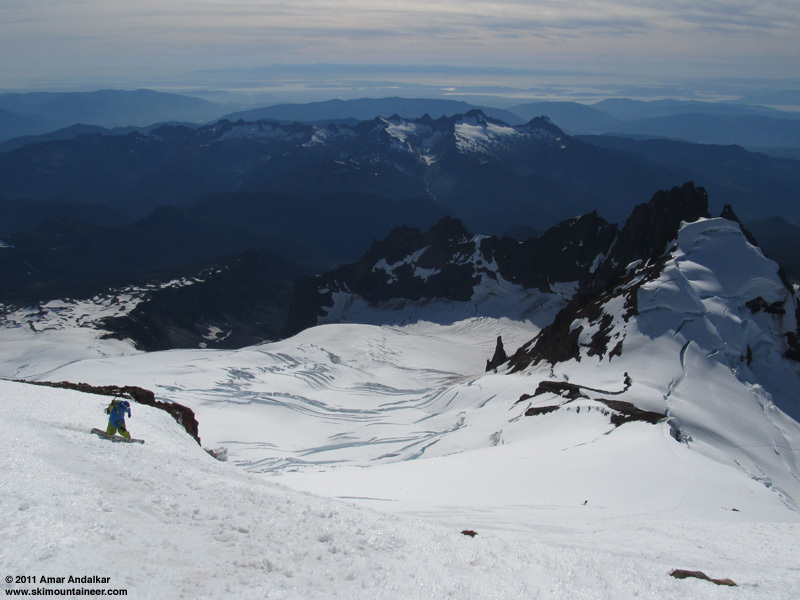 We booted up the steep glacier terminus in ski boots and crampons, too hard-frozen to skin, then switched to skinning on the flats above near 6600 ft. Snow coverage (last season's settled snow) on the Coleman Glacier is outstanding, almost no bare ice even at the toe, and crevasses are mostly well-covered. 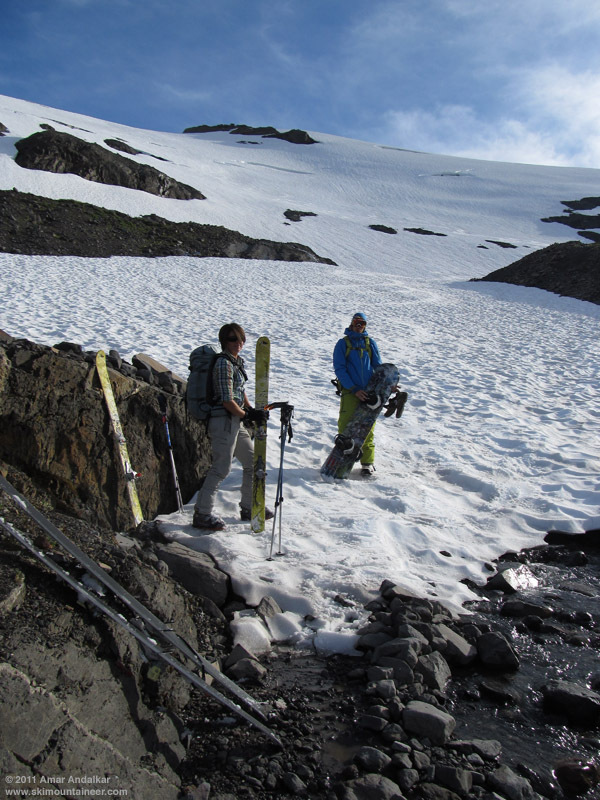 About 6-8 ft of snowpack remains atop the glacial ice even at the terminus. It really looks like typical July snow coverage up there, not like late September. 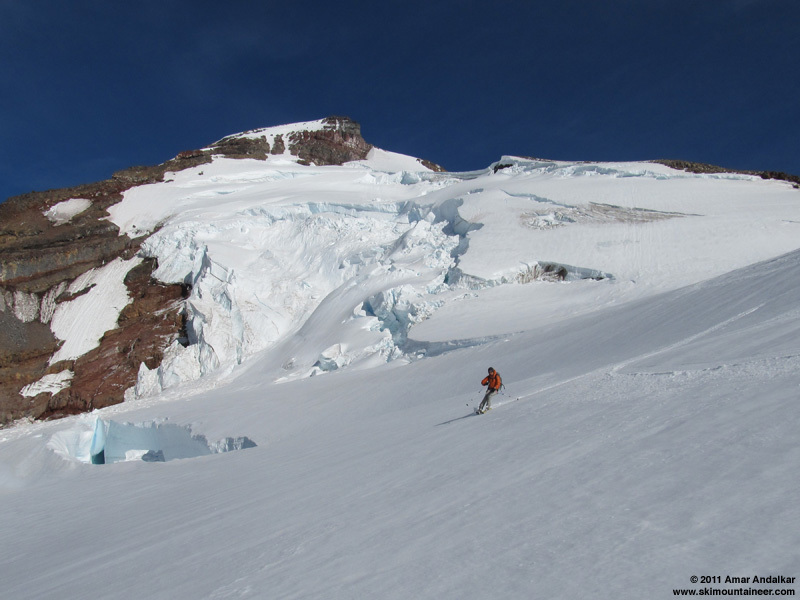 Cramponing up the steep terminus of Coleman Glacier, with thick snowpack visible in the open crevasse. New snow had fallen down to about 7500 ft over the weekend, much lower than expected. It was thin and patchy at first but much deeper and nearly full-coverage by 8500 ft. The storm layer consisted of several inches of new snow (over 1 ft in places) which had been rained on and quickly consolidated, the grains were already rounded and corn-like only 2 days after the storm. The bergschrunds near 8600 and 8800 ft are still very well covered and easily crossable, and even though we skinned across several 1-3 ft wide cracks, those could have been end-run if preferred. We brought rope and glacier gear, but never felt the need to use it. 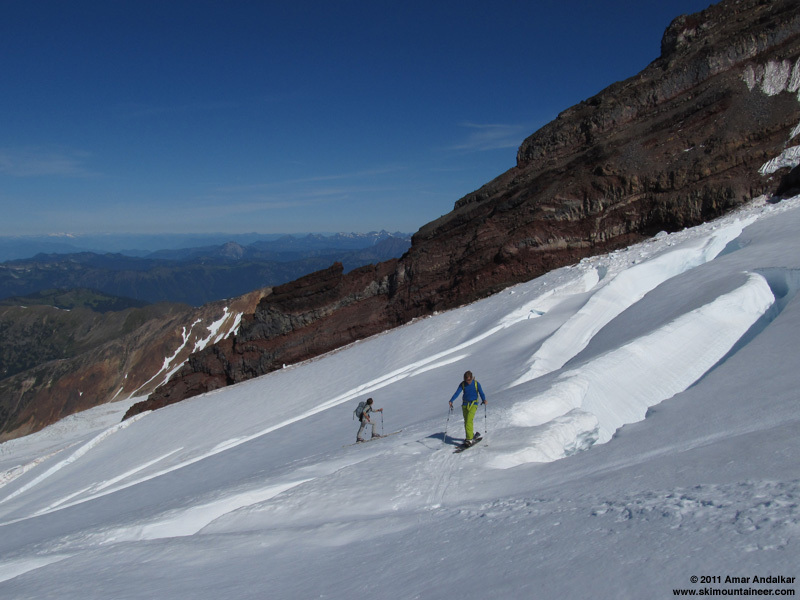 Skinning above 8000 ft on Coleman Glacier. 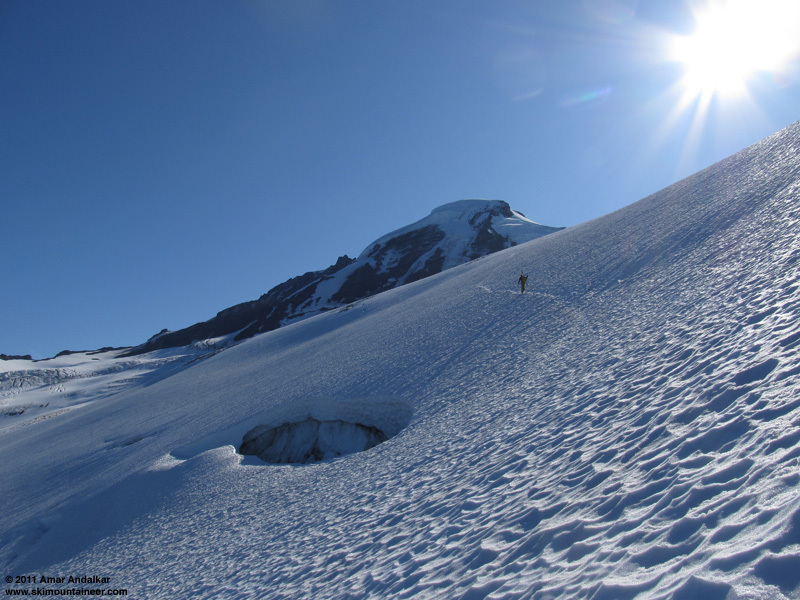 Ski crampons were helpful, since steeper north-facing rolls had not softened even as the noon hour neared. Steep skinning below the icefalls of Colfax Peak. Skinning across a snow bridge near 8800 ft.
We passed a pair of descending climbers as we neared the 9000 ft Coleman-Deming saddle, the only other people on the route this day. Above this point I stayed on skins with ski crampons, while my partners switched to booting the rest of the way. 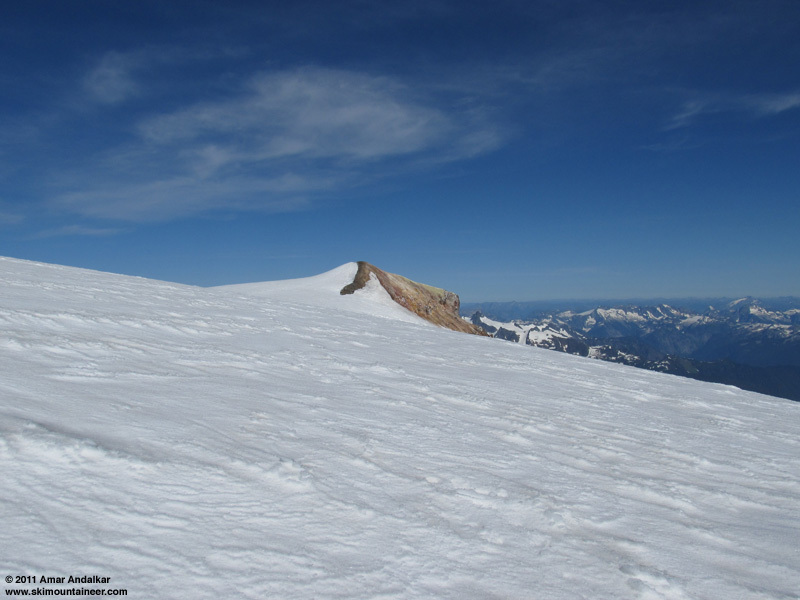 The new snow made it possible to skin up the snow along the north edge of the pumice ridge, it had softened just enough for grip by this time despite its northerly aspect. The snow was continuous except for a single ski-length gap of bare dirt near 9300 ft where the route crosses through onto the south side of the ridge. 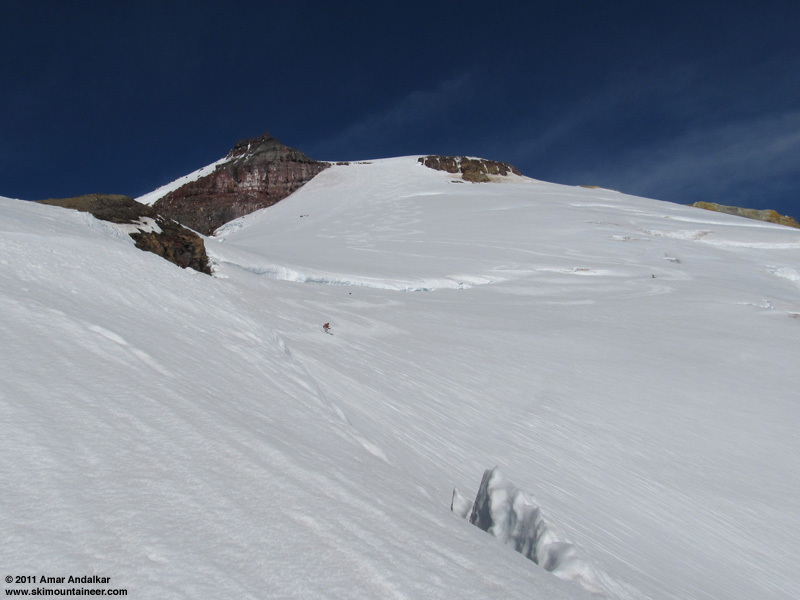 Then by angling across the solidly snow-bridged moat onto the Deming Glacier just above this point, one could avoid any need to walk up the bare pumice ridge and remain on continuous snow the rest of the way to the summit. 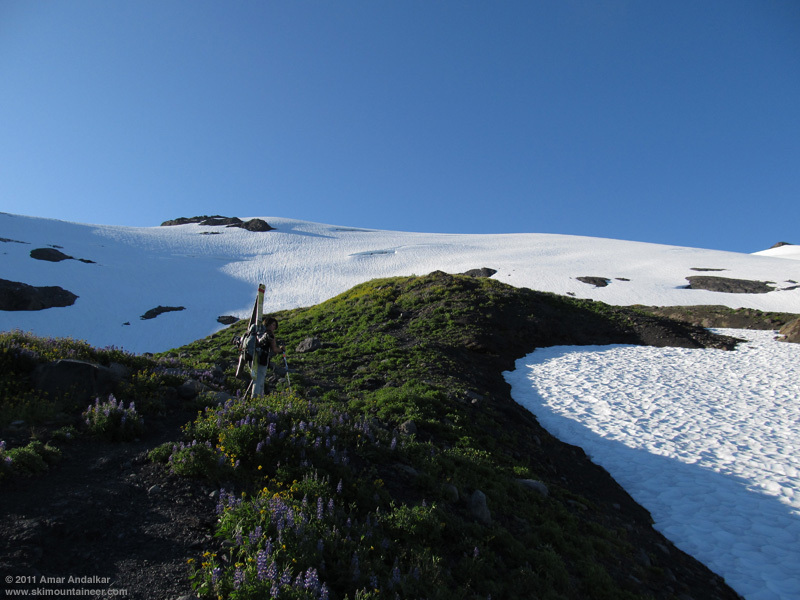 My skin track ascending new snow on the pumice ridge, just above the ski-length bare patch. 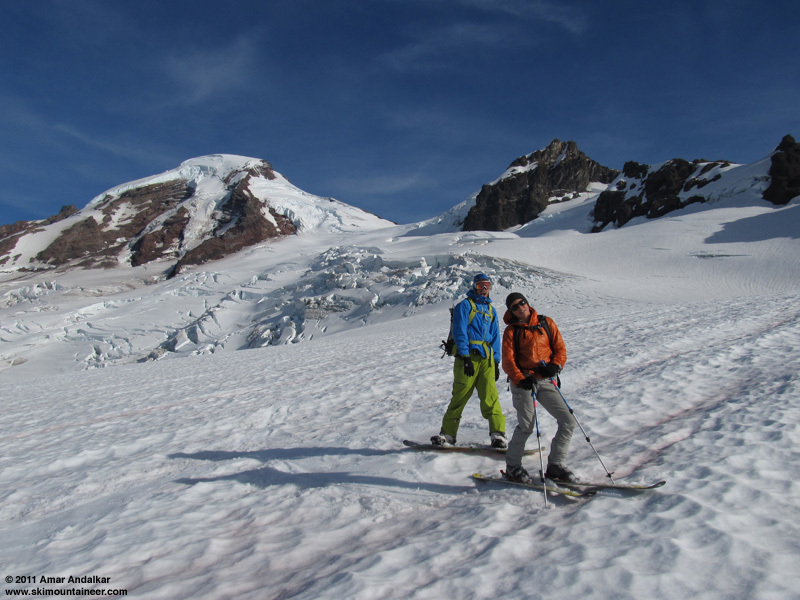 Far across the glacier, we noticed a party of 3 skiers approaching Sherman Crater via the Squak Glacier route. Snow conditions on the Deming Glacier and Roman Wall were excellent for skinning, with several inches of consolidated snow and well-softened now after 2pm, enough to put in a solid switchbacking skin track up the steep face. But the uppermost 100 ft had lots of fingers of clear water-ice, making skinning more doubtful. Luckily even those had softened enough to shear off easily underfoot, and it was quite a relief to finally pass through the rollover onto the gentler summit dome. The first time I've ever managed to skin all the way up this side of the Roman Wall (it's steeper than the eastern end approached via the Easton or Squak). Looking down the Roman Wall from the edge of the summit dome. 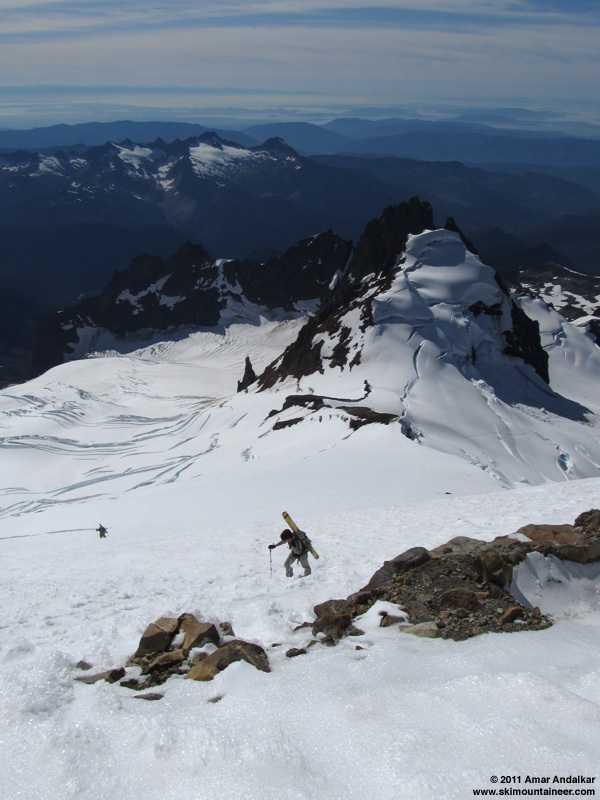 We held a level traverse near 10700 ft around the southern flanks of the summit dome towards Grant Peak, arriving at the top just before 3:30pm and almost simultaneously with the 3 skiers who had ascended the Squak. 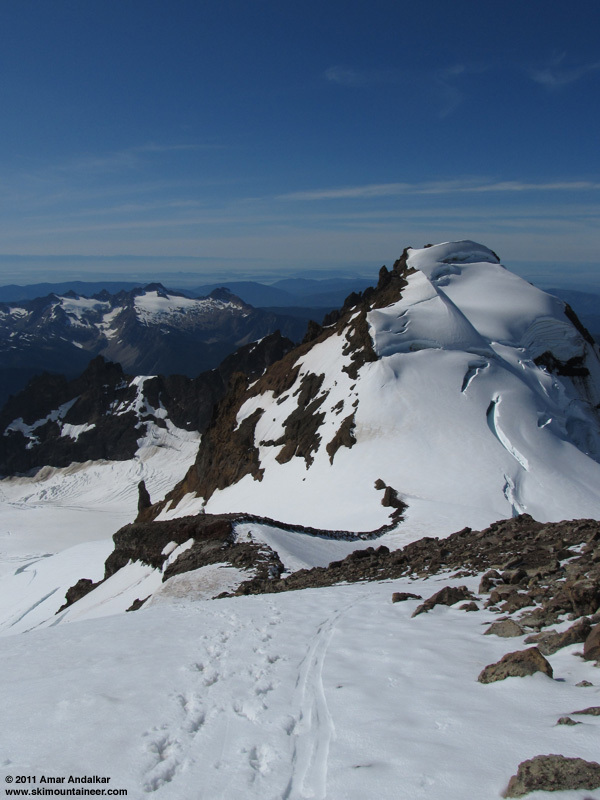 Snow still extends to within less than 1 vertical foot of the true summit, quite remarkable for the last days of summer. Looking across at Grant Peak with Mount Shuksan in the distance. A bit chilly atop the summit despite the glorious sunshine, with temperature 36 �F and a steady 15 mph SW breeze. Given the late hour, we exchanged a few quick greetings with the other group (samthaman and 2 friends from the East Coast) and then headed back around the summit dome. We skied down at 4pm. Dropping over the rollover was a bit rough for the short section with the icy fingers, but that quickly gave way to smooth sweet corn the rest of the way down the Roman Wall and upper Deming Glacier. 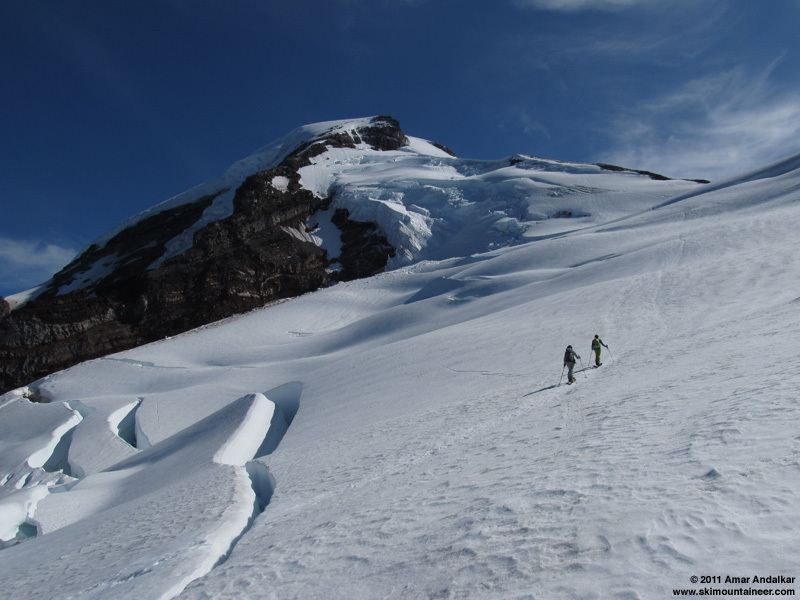 We end-ran the left side of a major crevasse, then angled back right and over a very fat snow bridge across the moat to regain the pumice ridge. 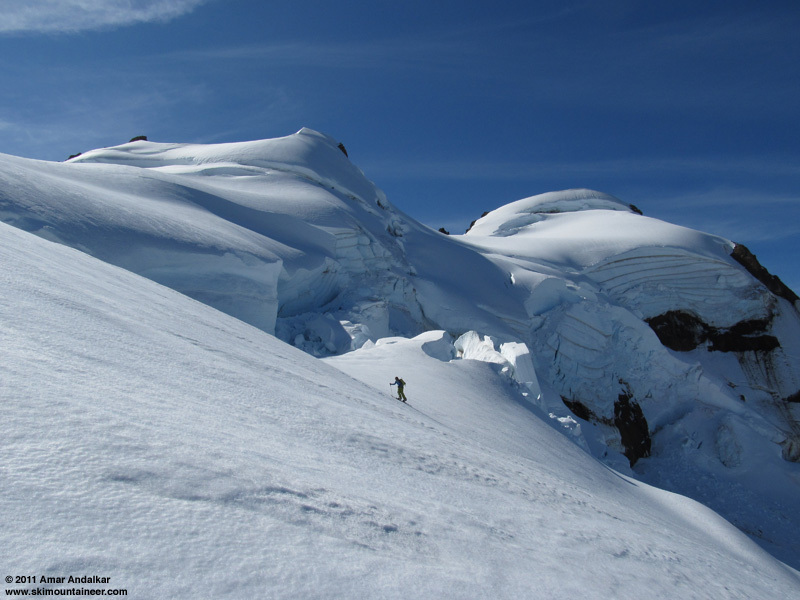 Skiing corn on the Deming Glacier, looking up from the snow bridge onto the pumice ridge. 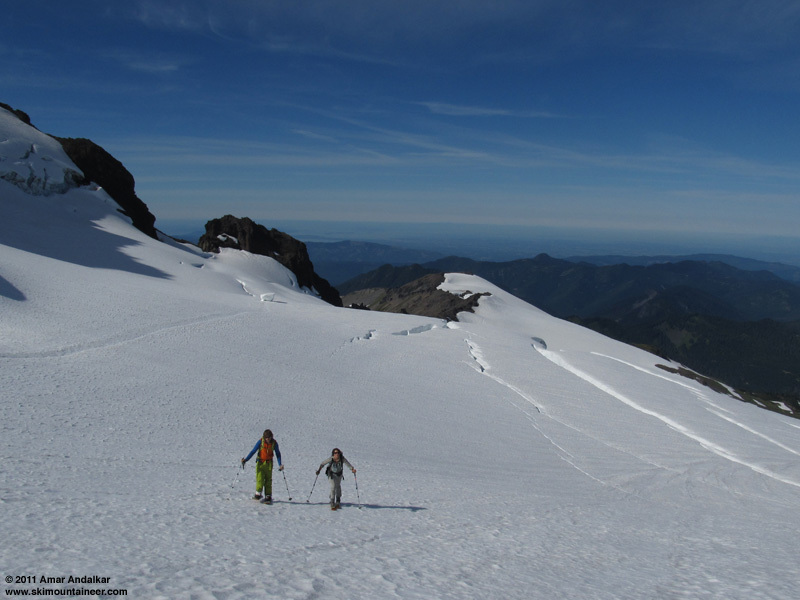 A quick step across the muddy dirt of the ski-length gap, then back to more corn on the Coleman Glacier. The warm day and ample sunshine had nicely softened even these northerly aspects. Smooth corn on the Coleman Glacier. Even as the new snow thinned and faded out, the ski conditions remained very good. The old settled snow was fairly smooth and minimally suncupped all the way down to the flats at 6600 ft. Interesting chunk of snow with a tunnel, sitting on the Coleman Glacier above 7000 ft. The snow at the glacier's terminus was the worst of the day, slightly suncupped a few inches deep, but even that part had softened enough for enjoyable turns. We grabbed our shoes where we'd left them at the edge of the snow near 6000 ft, and then continued skiing down a nice gully east of the campsites to about 5800 ft. The end of the snow near 5800 ft.
A brief rest, some food and cold water, then loaded up and heading out just after 5pm. About 80 minutes of hiking brought us back to trailhead with plenty of daylight to spare. 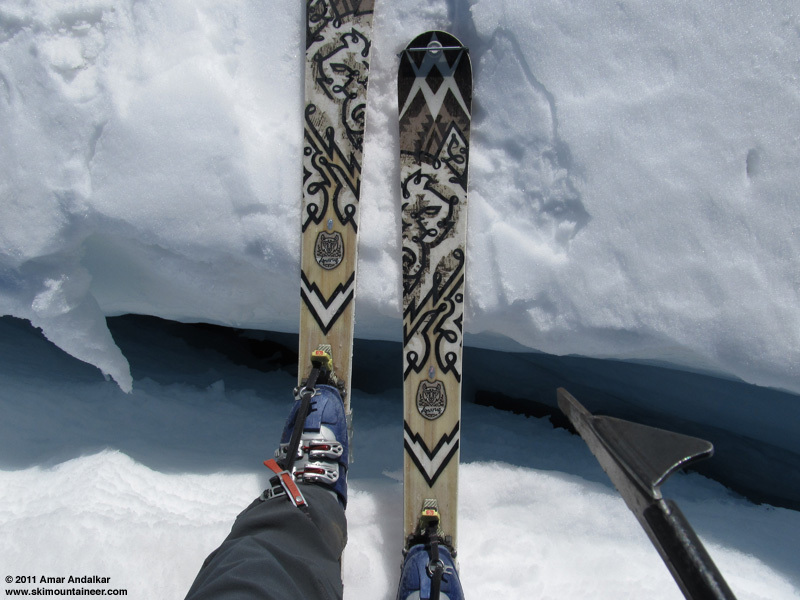 Another amazing day high on the Great White Watcher, with beautiful weather, fine company, and really excellent skiing. Can't beat that only 3 days before the end of summer! Glad the three of you had a good day. I remember those late September/early October Baker runs. It made me think of this song: BITD. gorgeous .. glad it all worked out for ya .. tues was the day! I love seasons that start with a snowpack. Glad the three of you had a good day.� I remember those late September/early October Baker runs.� It made me think of this song: BITD. Yeah Tony, just think: last time we were dawn patrolling like mad up Snoq. Mtn., those that were 5 years old, are now 10! That's a long time ago. Some of those Sept-November C/D days are certainly some of my best memories. This year I'm back. Let's do it! Shiny, happy people. Jealous, as usual. Thanks for your report, Amar.